Wrapped Coral stitch is also known as Coral knot with an extra wrap. It is a variety of Coral Stitch that produces a thick bobbly line ideal for surface embroidery. Wrapped Coral is quick to work creating a knotted line that can be mistaken for a line of French knots. Wrapped Coral stitch follows a curve well and is great to use along the edge of items. I go through phases of working this stitch, then not using it often. I work this stitch for a while then I forget it, then I rediscover it and ask myself why I don’t use it simply all the time. I usually use a twisted thread such a cotton perle #5 and work the stitches close together so the knots look like a string of beads. 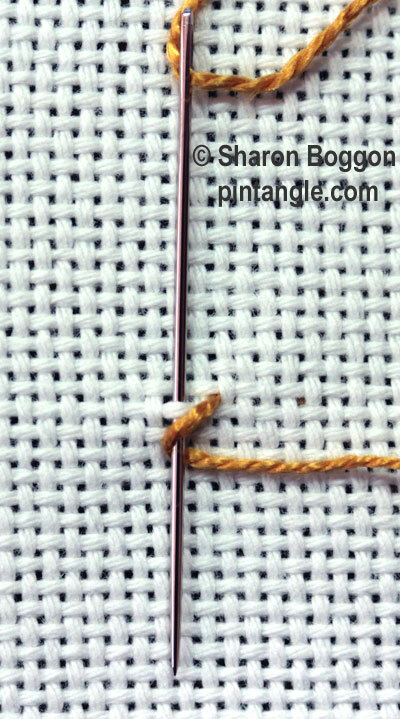 Work this stitch from right to left and it is most effective if you work the knots close together. 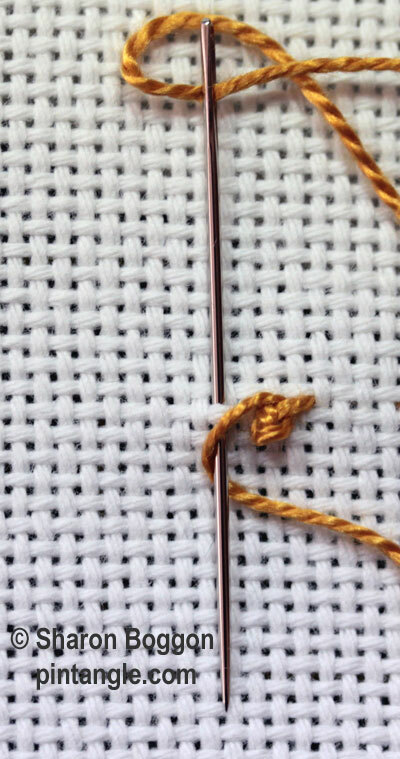 Once you have made the first coral stitch, slide the needle under the bar of thread that sits to the right of the knot and then take your thread through. Take your thread around the knot. This is the ‘wrap’ and hence the name. Make another coral stitch and continue down the line. Wrapped Coral Stitch is a quick effective linear stitch which has an interesting texture. It follows a curve well. I hope you enjoy experimenting with Wrapped Coral Stitch. You can have Pintangle delivered to your inbox by using the ‘follow” feature in the sidebar. Just enter your email address, and when you get the confirmation email make sure you say yes and you are all set! If you are on a mobile or tablet you will need to scroll to the bottom to find the follow’ feature. 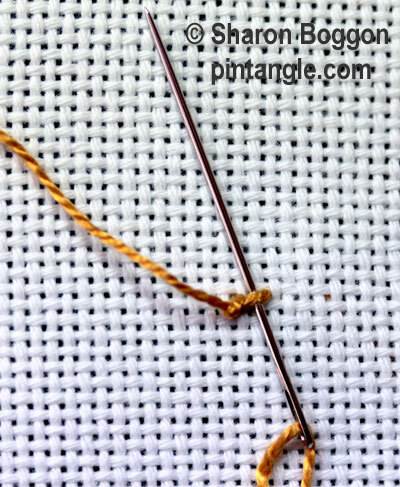 This neat looking stitch is also new to me. I’ll try it today. Speaking of little samples… this one is as little as it gets. But I figured it out and like it very much! I think I need a lot more practice with this one! Have a look at 3 more samples, stitches 23 to 25 as well as my accordion style sample books. This stitch looks lovely, it’s new to me. Looking forward to give it a try. Are you going to create a Flickr group for embroidery made with these stencils?